Developed as next generation servo motor based on moving coil technology. SMAC's "Snap-Together" design controls tight tolerance stack-up to assure high product quality and achieves competitive price due to fewer parts. The LCA is designed to offer extremely long life cycle well over 100 million cycles at high speed applications. The range starting compact size with 8mm in height, ideal for electronics pick and place head, or force up to 90N for high speed and high cycle applications. 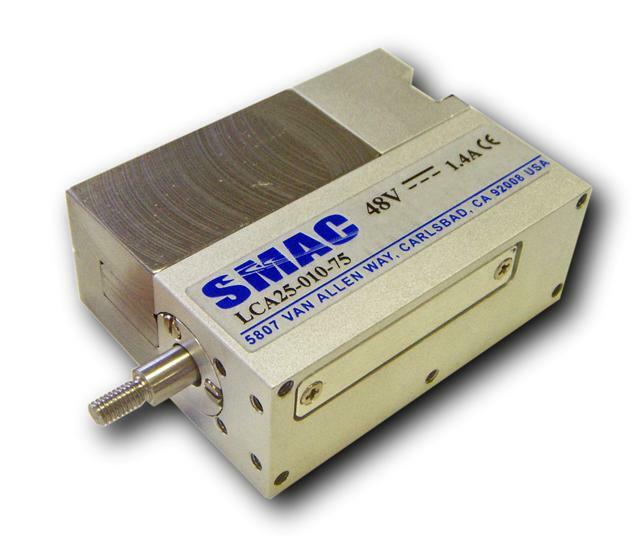 As with all SMAC actuators the LCA are fully programmable in position, velocity and force with feedback capability. SMAC's patented "Soft-Land" function is incorporated for precise force control. No cable required for flying lead option. Linear encoder resolutions: 5µm standard, 1µm, 0.5µm and 0.1µm optional for most units. Consult factory for availability. Return spring: Prevents the shaft from dropping during vertical operation when power is cut. Vacuum: Vacuum through the shaft or on the shaft for pick and place applications. Extended nose bushing: For tighter shaft run-out and higher side load onto the shaft. Increase of max. force & acceleration: 48 volt coil and double coil options are available for some units with 24 volt single coil.